Western sanctions won’t change any business plans for the Russian oil company Gazprom Neft during what’s left of 2014, but a senior executive says it is considering options for next year. Even now, Gazprom Neft is feeling a bit of a pinch, Deputy CEO Vadim Yakovlev told reporters on Sept. 15 aboard the Prirazlomnaya oil rig in the Pechora Sea in the Russian Arctic. “I do not think that we can stop our projects due to problems with financing,” he said, noting that borrowing has become more costly as the number of offers for financing declined. The sanctions, imposed Sept. 12, shut out Gazprom Neft and other Russian energy companies from Europe’s long-term borrowing market. They also forbid Western companies from supporting Russian firms in exploration or production in deep water, Arctic offshore and shale projects. 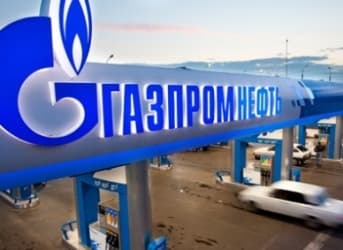 Nevertheless, Yakovlev said, Gazprom Neft expects to increase oil output by 2.5 percent and hydrocarbon output in oil equivalent by 5.5 percent by the end of 2014. In 2015, oil production will increase, financed by the companies existing projects in Prirazlomnaya, Iraq and elsewhere. In fact, Yakovlev said, the sanctions won’t affect the company’s more protracted projects for oil extraction from submerged shelves, mostly the Pechora Sea shelf in the Russian Arctic. “We are not changing our long-term plans under the project,” he said. Still, Yakovlev conceded that plans for investment and production in 2015 and beyond are still under consideration. But he stressed that Gazprom Neft’s business partners denied services because of the sanctions only a very few times. Yakovlev explained that most of the company’s partners keep their equipment and service operations in Russia and therefore are beyond the reach of sanctions. On Sept. 12, after the European Union sanctions were announced but before the United States made public its own sanctions, Yakovlev said he expected the sanctions wouldn’t affect Gazprom Neft’s pursuit of its long-term goals. But once he learned of the U.S. sanctions, he grew more cautious. “If events go under the most negative scenario,” he said, “we are working at options to buy [equipment] from alternative sources or producing it by Russian or Asian companies.” He didn’t name any of the companies that Gazprom Neft may have to turn to. The Arctic contains an estimated 20 percent of the Earth’s so-far undiscovered deposits of fossil fuels, and Russia itself is thought to have the world’s largest deposits of shale oil. Moscow now extracts only a small fraction of these resources, but if it can increase production, it can probably support other production without outside help. But that probably would require long-term financing, which is strictly limited under the new sanctions.